This ancient old temple is dedicated to Lord Srikanteshwara (ಶ್ರೀಕಂಠೇಶ್ವರ) or Lord Nanjundeshwara (ನಂಜುಂಡೇಶ್ವರ) at Nanjangudu (ನಂಜನಗೂಡು). It is also known as “Dakshina Kashi” or “Varanasi/Prayag of South”. 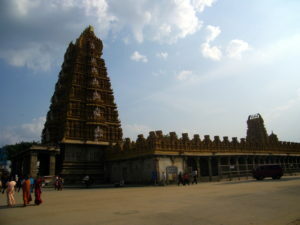 It is also one of the largest temple complexes in Karnataka. The temple is believed to have been established by the legendary Rishi Gautama thousands of years ago. The name Nanjundeshwara means the God who drank the poison – Nanju (ನಂಜು) means poison. During the Samudra Manthan or the Great Churning of the Ocean of Milk when the poison came out (halahala), Lord Siva rescued the world by drinking the poison. Devi Parvati held his throat tighly to prevent the poison from going into his stomach. 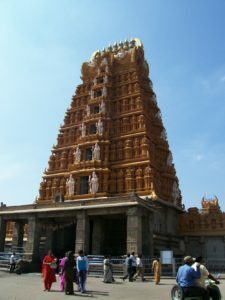 Thus, the temple got its name as Sri Srikanteshwara Swamy or Lord Nanjundeshwara, and town Nanjangudu got its name as the residing place of Lord Nanjundeshwara. Nanjangudu (Also known as Galapuri) is by the banks of the River Kapila (Kabini), one of the tributaries of River Cauvery. The temple has been built and renovated for about 10 centuries by kings from the Ganga, Chola, Hoysala, Krishnadevaraya, Dalavoy and Wodeyar dynasties from the 9th century. There are more than 100 Shiva Lingas of different shapes and sizes, of which the Sahasra Linga is highly revered. Twice a year, devotees participate in large numbers during the Chariot Festival / Rath Yatra known as Dodda Jathre and Chikka Jathre. 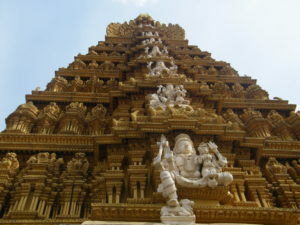 Sri Srikanteshwara Swamy Temple, Nanjangudu has a number of legends associated with the Samudra Manthan. This is said to be the place where Mother Lakshmi, who emerged during the Samudra Manthan, prayed to Lord Shiva to be married to Lord Vishnu. 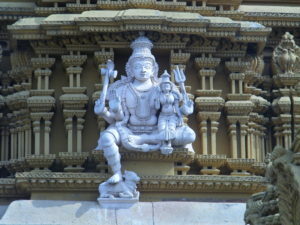 Siva then blessed her, and solemnized her marriage with Lord Vishnu. Lord Shiva fulfils desires of devotees who pray to him with true devotion. The rakshasa Kesi cunningly drank Nectar / Amrit from Mohini (An avataar of Lord Vishnu). He tried to destroy Lord Brahma’s yagna on the sangam of the rivers Kapila and Koundini. Lord Shiva intervened. He hurled the rakshasa Kesi into the Yagna kunda fire, and swallowed the ashes of the Demon. Lord Shiva had to undergo physical suffering for swallowing the ashes of the rakshasa. Thus, Lord Shiva relives the physical suffering of his devotees here. This is also called Parashurama Kshetra, where Parashurama cleansed himself from the sin of beheading his mother. Lord Nanjundeshwara is also called as “Vaidya Nanjundeshwara” and is a healer for his devotees suffering. Lord Srikanteshwara relieves his devotees from physical ailments during Lifetime and Releases them from the vicisious cycle of Death and Rebirth. Due to immense power of Nanjundeshwara, people were freed from sins and directly went to Swarga leaving the Lord of Death – Yama, jobless. It is said that the Mysore King Tipu Sultan’s beloved elephant’s eyesight was restored after prayers to Lord Srikanteshwara. Lord Nanjundeshwara was thus also called “Hakim Nanjundeshwara” by Tippu Sultan, who donated a Shiva Lingam made of jade (precious green stone) along with an emerald necklace. 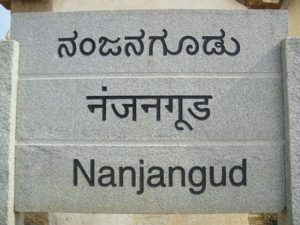 Nanjangud is just 1 km off the Bangalore – Ooty highway, near Mysore, Karnataka. 206 kms south of Bengaluru International Airport, via Mysore. 23 kms south of Mysore. 105 km north of Ooty. 180 km north of Coimbatore. 190 km east of Kozhikode. Nearest airports: Mysore, Kozhikode, Coimbatore, Bengaluru.